Can two fish, tails going swish, help? Will three moose, munching on spruce, be able to pull the unlucky duck out of the muck? Now perfectly sized for small hands, this counting rhyme is a feast of sounds and numbers that will have young listeners scrambling to join the slippy, sloppy fun! Phyllis Root says she wanted One Duck Stuck "to be a north woods wetlands counting book, accurate to the marshes of Minnesota. All the animals are actually found here. I love to go canoeing and camping, and this book is a composite of my own experiences." Phyllis Root has written many books for children, including WHAT BABY WANTS, ALL FOR THE NEWBORN BABY, and KISS THE COW! Jane Chapman has a pet tortoise named Muggs, who at the age of seventy is a family heirloom, and one day she would like to have a duck as well. She is the illustrator of several books for children, including THE EMPEROR'S EGG by Martin Jenkins and THE STORY OF CHRISTMAS by Vivian French. 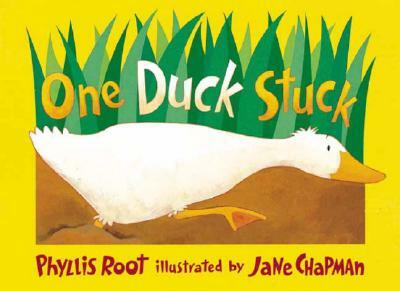 Just as the title of this satisfying counting book says, there's one duck stuck (in the muck, as it turns out). Different groups of marshland creatures, from two fish to ten dragonflies, appear with an offer of help . . . [children will be] enchanted by Chapman's vibrant pictures and the immensely satisfying sounds and rhythms of Root's text. Perfect for reading aloud, this counting book not only contains bright bold illustrations but also has lots of 'clomp, clomp' and 'splish, splash,' as well as other sound effects that children will love to replicate... great fun and sure to become an instant favorite among the toddler crowd.